At Crackmasters Auto Glass in Moose Jaw, we offer a wealth of auto repair services to get your vehicle back to looking like new once again. Contact Crackmasters Auto Glass shop for a quote on any of the below services today! 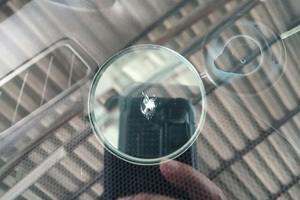 When pebbles, stones, or hail come into contact with auto glass, small chips can result. The damage to a chipped windshield may not look too extensive, but it can “spider out” into a long crack or several cracks that can be more difficult to repair. As soon as you notice a chip in your windshield, contact your local Crackmasters to have it repaired! 1. We clean the chip and remove any air pockets that may have formed inside it. 2. Using a special drill, we open the chip slightly to allow the repair resin to flow into every part of the chip to create a strong repair. 3. We inject UltraBond repair resin into the chip. 4. With an ultraviolet light, we cure the resin so that it hardens to form a seamless bond with the glass. When repair is not possible, rest assured that our certified windshield replacement technicians will provide the best windshield replacement available outside of the factory. 1. We remove the damaged windshield and all but a thin strip of the old adhesive. This “full cut” method ensures the best bond possible, and is essential to a quality windshield replacement. 2. We thoroughly clean and prime both the windshield and pinchwheld. 3. 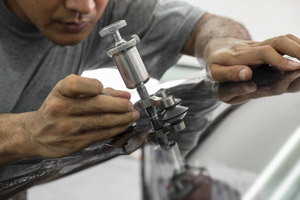 We professionally install your windshield replacement using the best available OE glass, and we use only urethanes that meet OEM and Federal Motor Vehicle Safety Standards for strength and safety. 4. 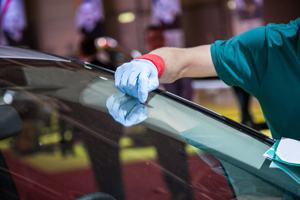 Once your windshield replacement is installed, we insist on a minimum cure time of 60 minutes. 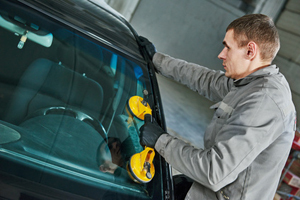 This ensures a proper bond and seal between the replacement windshield and vehicle frame. Some companies allow you to leave as soon as the replacement windshield is in place. This clears your vehicle from their shop quicker and allows them to do more windshield replacements, but it can be extremely dangerous. If an accident occurred before the adhesive sufficiently cures, the replacement windshield could separate from the frame and you could be ejected from the vehicle or your airbags could malfunction. Even hitting a bump or pothole could affect the bond, which is a safety concern and could cause leaks and excessive wind noise. Our insistence on a 60 minute “safe drive-away” time ensures your vehicle is safe to be driven (even if it means we do a few less windshield replacements per week). We use Roto Buff mini buffing pads to get into areas that traditional polish pads can’t. These polishing pads are simple to use, and we do have them for sale if you wish to polish and glaze yourself. All of Roto Buff’s polishing backing pads attach to any standard household drill. High-Tech polishing gets rid of unsightly scratches and scuffs. We use these products mostly on automotive vehicles, but we have polished boats, motorcycles, and anything else that needed a shiny new finish. 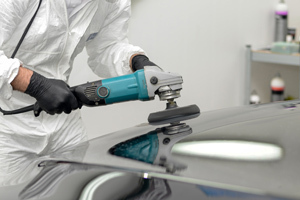 We offer comprehensive repair systems for unsightly spots and scratches. We do use Roto Buff’s products such as their scratch repair kits for automotive paint scratches, as well as other specialized auto repair tools to gently remove the blemishes from the surface of your vehicle. We will also smooth out, polish, and fill cracks or chips as needed for optimal restoration. For paint chips and other small paint repairs, count on Crackmasters Auto Glass to get it all cleared up! We offer professional colour matching to ensure a seamless and beautiful finish from top to bottom. Once our technicians have found the correct colour, we will then fill the chip or smooth out the area that needs repainting. 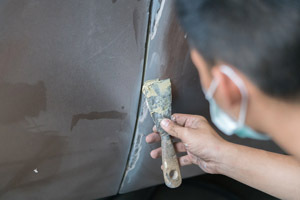 Just enough paint will be added to the specific area that was previously damaged, leaving your car looking as good as new. 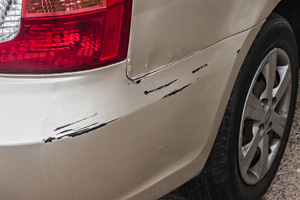 Bumper scuffs can easily happen in tight parking situations and minor traffic accidents. If you have recently accidentally bumped into an obstruction, we offer quick cleanup and repair of the scuffs on your bumper! Our technicians will use gentle cleaner and light tools to remove the scuff, leaving your bumper clear of accidental blemishes. A crack in your windshield, even a large or complex one, doesn’t necessarily mean you’ll need a replacement. Crackmasters can repair most windshield cracks, even those 12 to 14 inches in length. And, in most cases, you won’t even be able to tell there ever was a crack in your windshield in the first place. 1. Crackmasters’ certified technicians will carefully inspect the damage to your side door glass to determine whether or not we can repair it. If it’s necessary to replace your car’s side door glass, we’ll remove the interior panels to access the mechanism that raises and lowers your window. 2. We’ll vacuum any glass or debris that is still inside the door or the vehicle, and remove any larger broken pieces from the window frame. 3. We’ll install brand new, original equipment side door glass and perform thorough tests and evaluations to make sure it works properly. 4. We’ll replace the door panel, clean all your auto glass, and send you on your way! 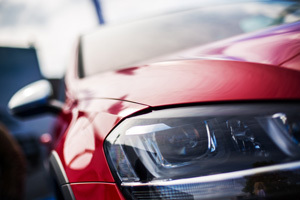 The headlight restoration process is simple, but there are quite a few steps. They include taping off the headlight to protect your paint job, wet sanding the lenses with multiple grits of sandpaper, and polishing the lenses. If you are a do-it-yourself type of person and you have an extra supply of elbow grease, you can even restore your headlights with a top-notch kit from Meguiar’s.